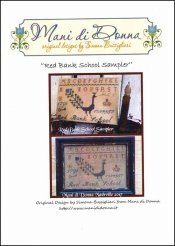 Red Bank School Sampler [C5109] - $15.00 : Yarn Tree, Your wholesale source for cross stitch supplies. Cross Stitch pattern from Mani di Donna. A Peacock is standing in the middle with the alphabet stitched above. "Red Bank School," is stitched below the Peacock. A key, a crown, 1791 and the numbers 1-7, are stitched around the Peacock. Stitch count is 130 x 87.